Who Do Journalists Follow in Twiplomacy? Two weeks ago I purchased a copy of the Financial Times before boarding a plane in Geneva. I admit that this was a bold decision given the fact that I have a very poor understanding of financial matters. Yet what surprised me about this specific issue of the FT was not its content but rather the frequent use of twitter as a source of information. The front page alone included three articles in which twitter accounts of world leaders or opinion makers were referenced. This finding rekindled a desire of mine to explore the twitter accounts of journalists in order to learn who they follow in the world of Twiplomacy. Traditionally, journalists covering international affairs would foster close relationships with embassy spokespersons as these could offer official statements on world events. Likewise, the post of embassy spokesperson was considered to be a demanding one as the spokesperson was in charge of both relaying information to the local media while ensuring that the local media accurately portray his government’s policies. And while the local media communicated with the embassy spokespersons, foreign correspondents were in charge of creating working relations with foreign ministries. Yet the age of digital diplomacy may have brought with it changes to the working routines of journalists as they can now directly follow embassies, foreign ministries, foreign ministers and even world leaders on twitter. These changes are of paramount importance to diplomatic institutions that rely on the media. Thus, if journalists now follow foreign ministers rather than embassies, these ministers must be sure to continuously supply information to the press and establish working relations with journalists. If, on the other hand, journalists still mostly follow embassies, than there is a need to encourage embassies to become even more active on twitter. 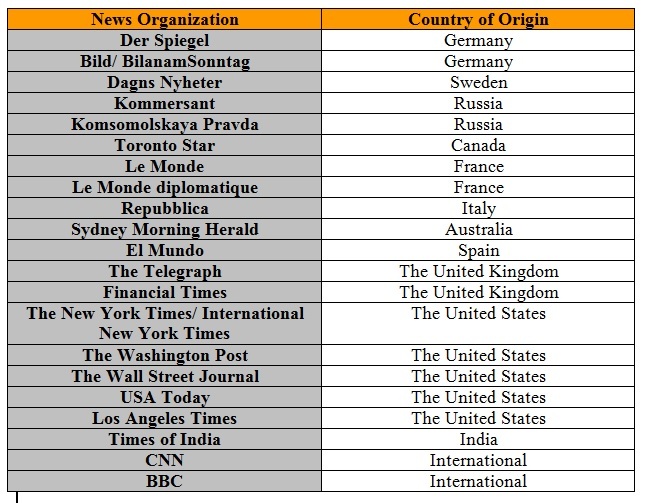 In order to analyze who journalists follow in the world of Twiplomacy, I compiled a sample of 80 journalists from prominent news organizations throughout the world. The sample included editors-in-chief, senior editors, digital media editors, foreign news editors, foreign affairs commentators and foreign correspondents. The table below details the news organizations comprising my sample. The profiles of all 80 journalists were analyzed by classifying who they follow on twitter into five categories: world leaders (e.g., US President, British Prime Minster), foreign ministers (e.g., US Secretary of State John Kerry), MFAs (ministries of foreign affairs), embassies (including embassy spokesperson), ambassadors, international organizations (e.g., United Nations, NATO, OECD, International Monetary Fund) and spokespersons (e.g., State Department Spokesperson, Spokesperson for Catherine Ashton, White House Spokesperson, NATO spokesperson). The initial results are shown in the table below. As can be seen, the most prevalent category is that of world leaders. It appears that in the age of Twiplomacy journalist use the official twitter accounts of world leaders as important sources of information to the extent that they attract more followers than MFAs which traditionally served as the source of information for journalists. Moreover, while MFAs are the second most prevalent category there is a substantial gap between their popularity and that of word leaders. The third most prevalent category is that of official spokespersons. This may not be surprising as spokespersons are in charge of supplying the media with information. 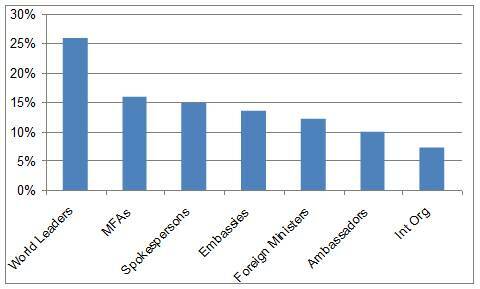 The fourth most prevalent category is that of embassies while the fifth is foreign ministers. These results bare both good and bad news for embassies. While embassies attract more followers than foreign ministers, their prominence as important sources of information seems to have diminished in the age of direct diplomacy. 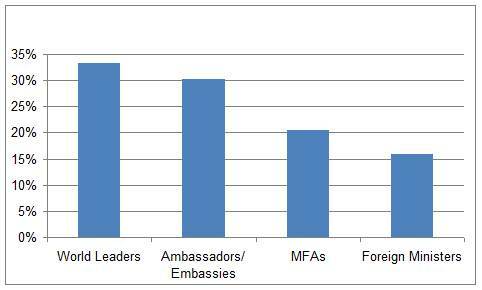 The least prevalent categories are ambassadors and international organizations. This finding should be of value to digital diplomacy teams in international organizations which seem to be lagging behind other diplomatic institutions. Following these initial results, I decided to make some changes to the aforementioned categories. First, I decided to remove the category of spokespersons and international organizations. This decision was based on a desire to focus on traditional diplomatic institutions and officials (i.e., world leaders, MFAs, foreign ministers, embassies and ambassadors). Next, I decided to merge the categories of ambassadors and embassies. This decision was based the finding that in many cases an ambassador’s twitter account also serves as the embassy’s official account. Once I hade made these changes I recalculated the prevalence of each category. These results are pretend in the table below. As can be seen, world leaders remains the most prevalent category indicating that journalists and editors mostly follow world leaders on Twiplomacy. This finding necessitates that world leaders use their twitter profiles to communicate information that is relevant to journalists such as official comments on world events and their government’s foreign policy initiatives. In other words, less Selfies and more substance. Most importantly, the second most prevalent category is now ambassadors and embassies. These come well ahead of MFAs and foreign ministers. These results indicate that even in the age of Twiplomacy, the brick and mortar embassy may have retained its position as an important source of information for journalists. Indeed it is this finding that should prompt MFAs to increase their embassies’ activity on twitter. It may also serve as a reminder to MFAs that an investment in digital diplomacy at the embassy level is a vital today and the embassy spokesperson was in the past. Posted in Uncategorized and tagged analysis, Digital Diplomacy, journalism, journalists, twiplomacy. Bookmark the permalink. Cyber Armies: Are Militaries Now Part of Digital Diplomacy?